viaLibri ~ List of Printed Forms for Sale by James Bain, 37 King Street, East. List of Printed Forms for Sale by James Bain, 37 King Street, East. 1857 - 1857 Catalogue of a Toronto Law Bookseller and Publisher [Legal Publishing]. James Bain. 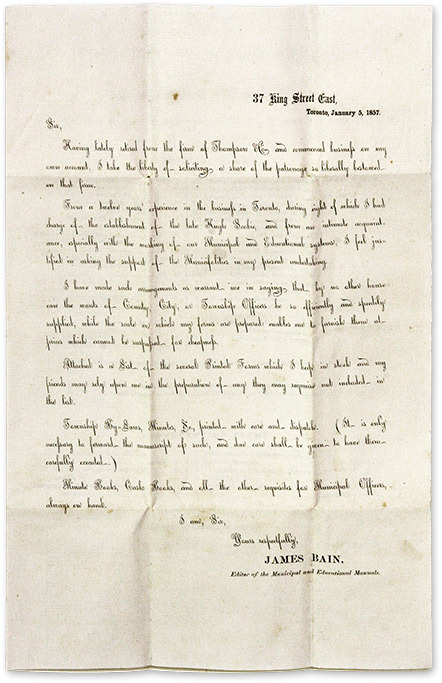 List of Printed Forms for Sale by James Bain, 37 King Street, East, Toronto. Toronto, January 5, 1857.  pp. Folio (13-1/2" x 8-1/4"). Single leaf folded to form bifolium, content to rectos, addressed on verso of second leaf, along with some early doodles. Light toning, two vertical and two horizontal fold lines, a few minor spots. A well-preserved item. $350. * Bain was both a publisher, editor and printer. His catalogue states:" I have made such arrangements as warrant me in saying that by no other house can the wants of County, City, or Township Offices be so efficiently and speedily supplied. Attached is a list of the several Printed Forms which I keep in stock and my friends may rely upon me in the preparation of any they may require not included in the list. Township By-Laws, Minutes, &c, printed with care and dispatch. (It is only necessary to forward the manuscript of such, and due care shall be given to have them carefully executed.) Minute Books, Cash Books, and all other requisites fro Municipal Officers, always on hand." This copy is addressed to the township clerk of Woolwich, Ontario. No copies listed on OCLC.